This tutorial will guide you the way to change voice while using QQ International with AV Voice Changer Software Diamond 8.0. On Voice Changer Software Diamond 8.0 main panel, click Preferences to open the Preferences window. Check Virtual driver Mode (1). 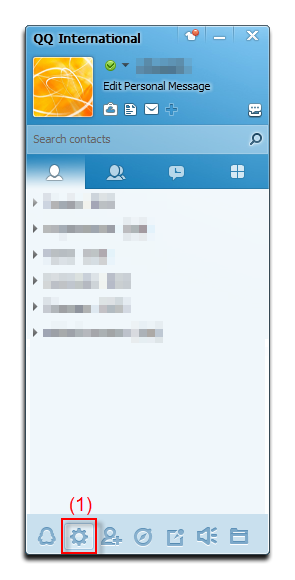 Click the OK button (2) to apply the new settings and close the Preferences window. 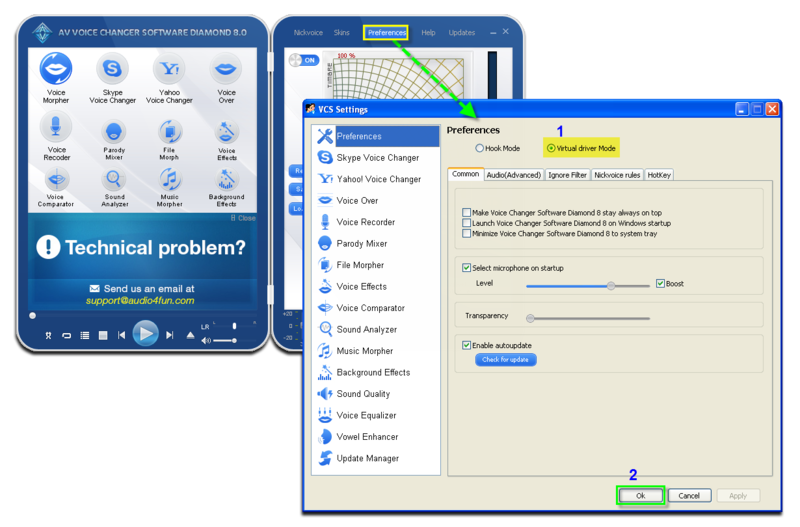 Return to Voice Changer Software Diamond 8, choose the morphing effects for your voice, and make adjustments until you are satisfied with the output voice. You should have known how to change voice using Voice Morpher feature. Run QQ >> Login to your account. Click on Setting icon (1) at bottom-left corner of QQ’s main panel to open QQ Settings dialog box. On General tab, choose Audio and Video(2) subtab. Click on Audio setting button(3) to open Audio/Video setting dialog box. 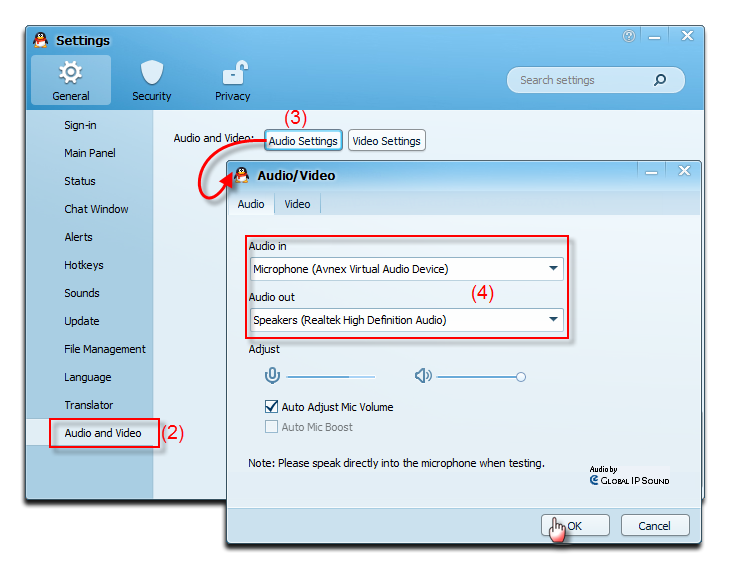 Choose Microphone(Avnex Virtual Audio Device ) and Speaker(Realtek High Definition Audio) (4) as Audio In and Audio out respectively. Click OK to apply settings and close Audio/Video dialog box. You now can do voice conversation with QQ in game. The morphing settings for your voice will be applied automatically. Note: While VCS Virtual Audio Driver is being set as the audio driver for QQ, do NOT turn off VCSD 8 while using voice chat via QQ. If you don’t want to use VCSD 8, change the audio settings of QQ back to normal audio source.